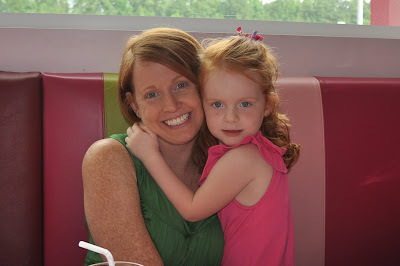 Confession Time....my girls will be 4 in less than 3 months and we don't travel with them. They are spoiled beyond belief, but typically spoiled in the state. We have access to a beautiful lakehouse in northern Indiana and we've done a couple long car trips, but all less than 5 hours in their lifetime. The trips we've taken we've opted to do as a couple, leaving them at home basking in the glory of being the only grandkids on both sides of our family. So, when we caught wind that Jeremy's good friend was getting married in Atlanta and knowing my high-school girlfriend relocated her family there last year AND we have wonderful family friends in that area, we decided the Memorial Day Weekend trip was in order. We planned to drive as a foursome, but my parents wanted to join in the fun to see our close friends, so Grandpa's frequent flyer miles were cashed in for Addy & Lilly's first flight! I thought it was important to have our car/car-seats and not pay out the a@# to fly with golf clubs and all our 'stuff', so we drove in the peace & quiet while the girls hit the sky! We were given strict instructions by Lilly, to make sure we "followed the big plane, not the little plane down to Atlanta." So that is what we did! 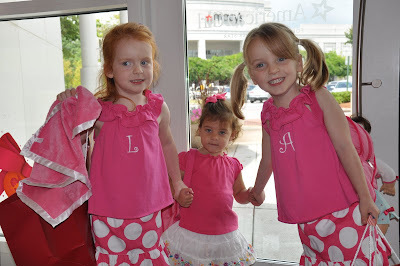 Once there, we hit great playgrounds, pools, the American Girl Place & the Georgia Aquarium. It was fun and a trip we will certainly do again. Thanks to Grandma & Grandpa Sadler for your help--the trip wouldn't have been possible without you! 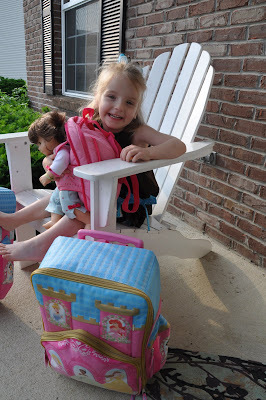 Addy, waiting for her ride to the airport, she'd been packed for days! 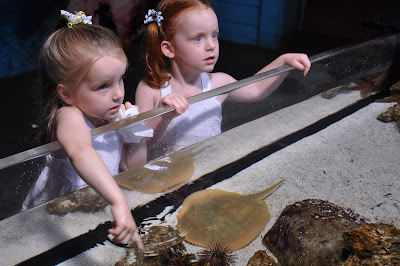 The sting-ray exhibit at the aquarium--they loved it! The girls and little Dakota Rose--showing this girl what power-shopping is! 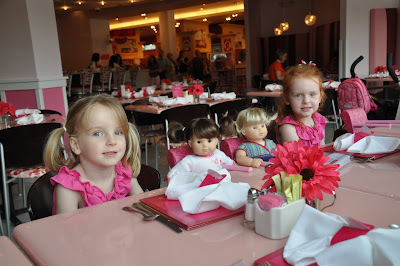 A & L and their dolls waiting for their lunch at the bistro-I'd spoken to a lot of skeptics about this place, but it is marketing genius and the girls were in awe! Lilly, came round the table to thank her mama for bringing her! The girls showed NO fear of flying and on the return looked and acted like seasoned travellers.Lilly made friends with several other flyers and they ordered their drinks from the stewardess with aplomb.All our fears of a meltdown at the airport or on the plane were groundless and the DVD players --to keep them entertained---were not needed at all! !All in all they kept us entertained but we were pretty exhausted when we gave them back to their parents. On the way out to Atlanta the girls were quiet and patient, On the return trip Lilly marched in front of Ian to board the plane toting her princess wheely. As she boards the plane she says to the stewardess " Hi my name is Lilly and I am in seat 24C - I would like cranberry juice and a snack please. The response was as soon as we are in the air - Lilly That will be fine Thank you!